New research conducted by a global independent safety firm has revealed that 99 percent of fake Apple chargers sold online fail a basic safety test (via BBC). The tests were commissioned by the U.K.'s Trading Standards and undertaken by Illinois-based global safety specialists UL. The insulation tests applied a high voltage to the chargers, which were bought online from eight different countries, including the U.S., China, and Australia. According to the results, only three out of 400 counterfeit chargers were found to have adequate insulation to ensure protection against electric shocks. Leon Livermore, the chief executive of Chartered Trading Standards Institute, described the counterfeit chargers sold online as an "unknown entity" and urged shoppers to buy electrical goods only from trusted suppliers. "It might cost a few pounds more, but counterfeit and second-hand goods are an unknown entity that could cost you your home or even your life, or the life of a loved-one," he said. Earlier this week, Amazon acknowledged a worsening counterfeit problem on its site and said it had made fighting the fake products a "major goal" going forward. The announcement followed a lawsuit filed by Apple last month against a company it accused of selling fake power adapters and cables on Amazon. Apple conducted its own tests and said it found that almost 90 percent of so-called genuine Apple products and accessories it had purchased from Amazon over the last nine months were actually counterfeit. "Counterfeit electrical goods are likely to be poor quality and in the worst cases unsafe," said Gillian Guy, chief executive of the U.K.'s Citizens Advice. "Look out for tell-tale signs of counterfeiting such as mistakes in brand names or logos, and check plugs for safety marks - all genuine electrical items made in the EU should have a CE mark on them." Trading Standards included guidelines in its press release to help consumers in the EU spot a fake charger, advising them to check pin size, look for regulation markings, warnings and instructions. In addition, Citizens Advice urged consumers not to overcharge appliances and to never cover devices when charging or use a charger with a cracked case or frayed cable. Well this very article refutes everything you've just said. You may not have had a problem with the cheap ones, but that doesn't mean they're not dangerous. This article is about cheap dodgy counterfeit goods. You will be perfectly safe buying cheaper chargers made by reputable manufacturers that are sold by reputable retailers who are all above board and are not bypassing the safety regulations. Apple is not the only the only company in the world that can make safe chargers. Which is why I will pay the premium from Apple and have piece of mind for safety related reasons. Well I guess that puts to bed any thought of buying an 'Apple' charger from anywhere but Apple directly. (As opposed to a different reputable brand). "... that could cost you your home or even your life, or the life of a loved-one," he said. This is going to get worse. The new MacBook Pros accept USB-C. Whereas chargers for iPhones just check the resistance over the USB wires, USB-C defines the Power Delivery protocol. Thus all chargers (and some cables) need to have firmware on board. So besides fake chargers, we now have reputable brands which bring out chargers with firmware bugs. What, you think he's overdoing it? That's just the second hit from my favorite search engine. But go ahead and save a tenner. I had the misfortune to happen upon one of these once. It blew up charging my iPod with a huge bang and such force it flew out of the wall socket and across the room. When I inspected it afterwards, the case blew apart and the insides were scorched black. The iPod survived. I now purchase all my chargers from Apple.com. Yes it's bit of extra cash but it's a small price to pay to not have your house burn down. That's a serious charge, but I have to agree. Surely there should be a happy medium where everyone can buy a safe, properly insulated chargers without being price-gouged by Apple? It would be nice if Apple took the lead (ahem) on this and said 'you know what, people dying or losing their homes because a power adapter they bought in good faith is a ridiculous situation, we are going to sell all our power adapters at cost price, because it's just too important, and if you're not dead, you're approximately 99% more likely to buy an Apple product again than if you are dead, so it's a win for us too'. The likes of Amazon and Ebay should be held to a higher standard in these cases. I have been stung in the past when buying something which looked like a genuine article from sellers appearing to be based in the UK only to find a counterfeit in the post from China. Ebay doesn't give 2 ***** about all the crap being peddled. The place really is a cesspool. Only if you buy them directly at the Apple store you can be sure they indeed are real. 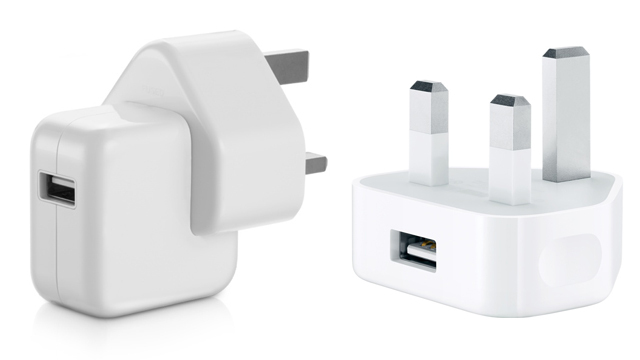 I have seen a lot of fake Apple chargers and forgeries are getting more difficult to spot. A couple months ago I bought 15 Lightning cables for $10. They're so well built I had to mark my original cables with a permanent marker. Having bought tons of fake cables over the last years I thought I knew how to spot a fake one. Well, with these ones it is just impossible. They're working great though. Which is I why I will only purchase from Apple.